At a summer venue in Kyōto, the sides of which open onto the Kamo River, guests are enjoying themselves and watching activities on the river, where other guests have settled onto wooden platforms over the water. The left half of the picture shows the rooms of a teahouse in central perspective (cf. cat. 40), while the right half follows other lines. Okumura Masanobu claimed credit for introducing the elements of Western perspective into Japanese woodblock prints with the invention of uki-e, “floating pictures”, or “perspective prints” as they are usually called. Western writers have often remarked on the naiveté of these apparently ineffective or imperfectly realised attempts at the depiction of three-dimensional space. To a Japanese eye of the early 18th century, which saw pictures in terms of the intelligent complication of a two dimensional flat surface, European prints which were known through the Dutch at Nagasaki must have seemed exotic, “naïve”, and “imperfectly realised” in their own way. The focus of this picture is a group entertaining themselves on the second floor of a teahouse in the Gion district along the west bank of the Kamo River. Below, on the river bed, other citizens are enjoying the evening breeze on wooden platforms extending out over the shallow stream, a popular summer custom in Kyōto until the Meiji period. On each platform is a paper lantern with the name of a shop or teahouse, that in the lower right hand corner being Iseya, the subject of a charming print by Harunobu in which two young women float sparklers on the stream. 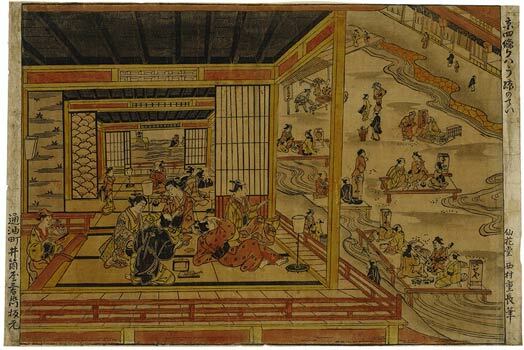 In the background, beside a miniature waterwheel, a man prepares tokoroten, a cool gelatinous noodle served in the summer; at the right a vendor offers grilled eel. The print has been trimmed to its borderline and lacks its original printed title, signature, and publisher’s address. The inscriptions that have been added on the right and left were probably taken from another impression of the print. Reproduced in Ingelheim catalogue, no. 14. Another impression is reproduced in Teruji Yoshida, Ukiyo-e jiten, Vol. 1, p. 292.